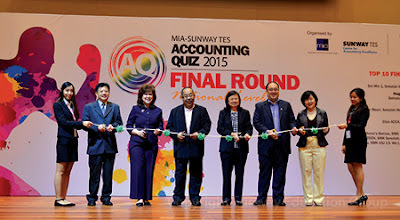 AQ 2015 is jointly organised by The Malaysian Institute of Accountants (MIA) together with Sunway TES Centre for Accountancy Excellence (Sunway TES) and supported by the Ministry of Education (MoE). The Association of Chartered Certified Accountants (ACCA) is the strategic partner of the event. The competition began in March this year, with an estimated total of 500 teams comprising 2,000 students from over 150 schools around the country took part in the various qualifying rounds. Team Athena’s Berries from SMK USJ 13, Subang Jaya, Selangor emerged as the Champion under the Team Category. Team Sin Min1 of SM Sin Min, Sg Petani Kedah was the first runner-up and Team Eliza ACCA of SMK Saint Elizabeth (M) Sibu, Sarawak, and the second runner-up. 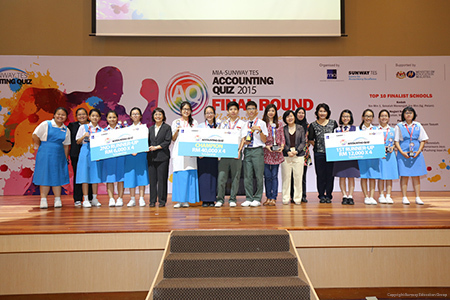 Top Three Individual Winners with Lim Tiew Ming, Director, Sunway TES Centre for Accountancy Excellence (6th from left) and Siew Wai San (7th from right), Director, Member Development & Education, MIA. 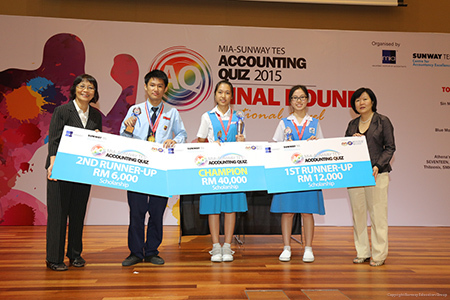 Meanwhile, Angela Yew Yee Jin from Team Eliza ACCA emerged champion for the AQ 2015 individual category. Ong Kwan Yen from Team Sin Min 1 was the first runner-up and Ivan Chew Cheng Yi from Team Athena’s Berries, the second runner-up. “This is the first time I’m participating in the competition and it feels amazing to win it,” said Yew who is currently preparing for SPM and deciding to continue either Accounting or Pharmacy in future. 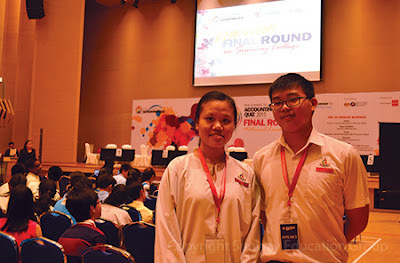 Yap Zhi Ching from SMK Serendah participating in the competition for the second time together with one of her teammates Khau Lap Choon who visited Sunway for the very first time found the competition interesting as it put their general knowledge to the test. The top three winning teams and individuals received scholarships and financial assistance worth more than RM300,000 to study accountancy at Sunway College. “This competition is created with the aim of inspiring, intriguing and encouraging students to pursue accountancy,” remarked Dr Elizabeth Lee, Senior Executive Director of Sunway University and Sunway Education Group, adding that the Sunway TES is working closely in line with the nation’s goal of nurturing at least 60,000 qualified accountants by 2020. The final competition was graced by Mohd Anuar Abdul Hamid, Senior Principal Assistant Director, Co-Curricular and Arts Division, Ministry of Education Malaysia. 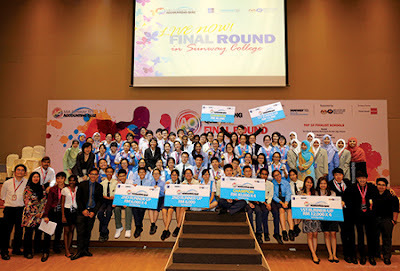 “We are happy to see a large group of students from SUNWAY TES helping to organise this competition,” added Abdul Hamid in his support of initiatives to expose students for real world experience. (L-R): Teo Ee Seng (Second from left), Executive Director, Sunway TES Centre for Accountancy Excellence; Dr. Elizabeth Lee, Senior Executive Director, Sunway Education Group and Sunway University; Mohd Anuar Abdul Hamid, Senior Principal Assistant Director, Co-Curricular and Arts Division, Ministry of Education Malaysia; Ho Foong Moi, CEO, MIA; David Chin, Head of ACCA Malaysia; and Siew Wai San, Director, Member Development & Education, MIA. Also present at the final competition were Ho Foong Moi, CEO MIA; Teo Ee Seng, Executive Director, Sunway TES Centre for Accountancy Excellence; Siew Wai San, Director, Member Development & Education, MIA and Lim Tiew Ming, Director, Sunway TES Centre for Accountancy Excellence. The competition which is open to all Form 4 and Form 5 students, was first held in 2013. AQ is aimed at exposing and garnering interest among secondary students in learning and gaining knowledge about the accounting field and the accountancy profession.